VB AntiCrack protects all strings in Visual Basic 5.0/6.0 source code. Its work is based on the principle that any cracker has to use string references to analyze and crack a program. To prevent this kind of attack, VB AntiCrack can encrypt all strings in your project before compilation. If you have compiled your application protected with VB AntiCrack, the binary file will not contain any strings from the source code. 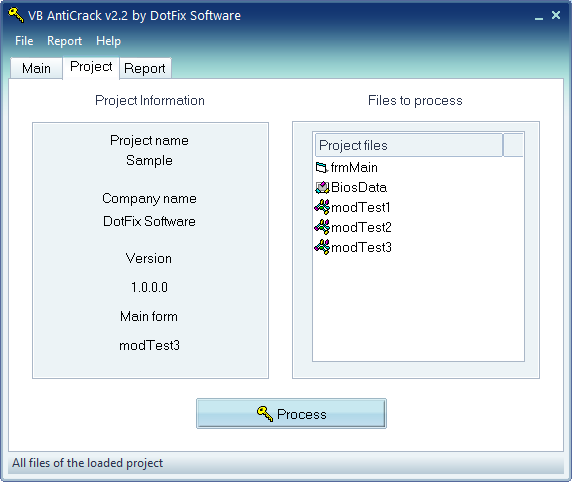 The cracker will not be able to find and extract any strings from your software because it is encrypted. The technology used in VB AntiCrack provides strong protection from fast cracking. To further protect your code and obfuscate internal compiler information, we recommend using DotFix NiceProtect. Has a user-friendly interface, with hints for all functions.